With Alisha’s cheerful and enthusiastic help, we’re sure getting a lot done this summer. Like I’ve said, she’s a whirlwind berry picker/garden harvester. Yesterday she picked the Provider beans again and got a huge, heaping basket full. (Remember, we just picked beans three days ago!) Because of my bad knees, I simply can’t pick blueberries anymore as it involves crawling along on the ground or much deep bending. But Alisha loves to pick them! So she drove to a nearby spot where she and Will had discovered an abundance of blueberries. She was gone all afternoon and came home with three ice cream buckets full. While Alisha was picking berries I went to work and cut up and canned all those Providers. I ended up with 10 quarts and five pints. And we’ll be picking them again in three days! I also went to work and cleaned out and arranged places to put all those wonderful things we’ve been canning as I was out of counter and island space. Like always, I move the new jars to the back and bring the older ones to the front so we can rotate our food. I carried boxes of full jars downstairs and brought empties up to fill. Will’s hard at work spreading manure on our fields and also between the rows of corn in the North garden. He’s hoping to be able to cut hay tomorrow. The weather forecast seems to be changing hourly. First it’s a 60% chance of rain. Then it’s sunny. Gee, sometimes it’s hard to know what to do! The Seneca Sunrise sweet corn has recovered from the attack of the corn earworm. The gardens continue to be awesome. Our Seneca Sunrise sweet corn has recovered well from the attack of the corn earworms and is now tasseling beautifully and silks are showing already — and no worms! The beans are terrific. In the next few days, we’ll be trying some of the Crawford pole beans, an heirloom bean we were given. They look scrumptious. And the Iroquois beans are so thick on the vines I can hardly wait for them to dry down as they are my favorite baked bean (so far!). 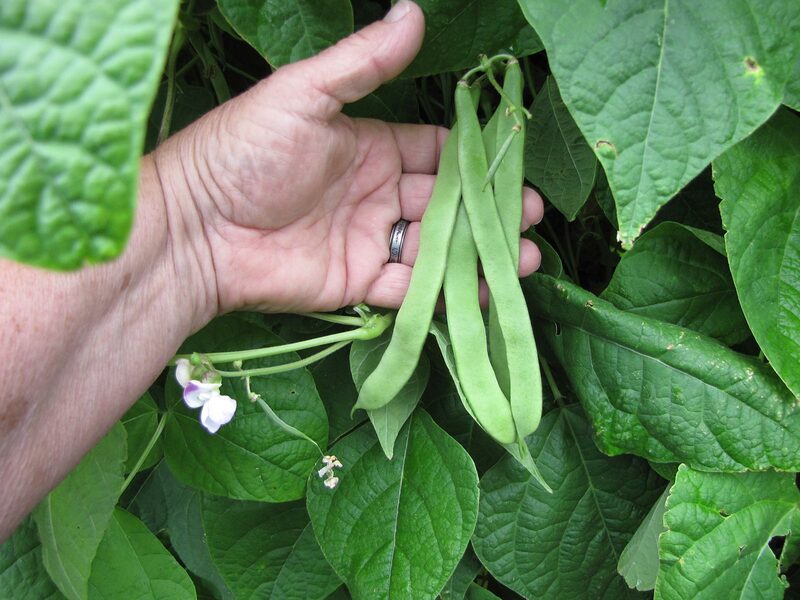 See how nice our Iroquois pole beans are doing? The vines are just loaded. I’m stunned by our lettuce row. By accident, Alisha and Will tilled that row up with the Mantis tiller. But many of the plants went on to not only survive but thrive. The Dark Red Lollo Rosso is gorgeous. 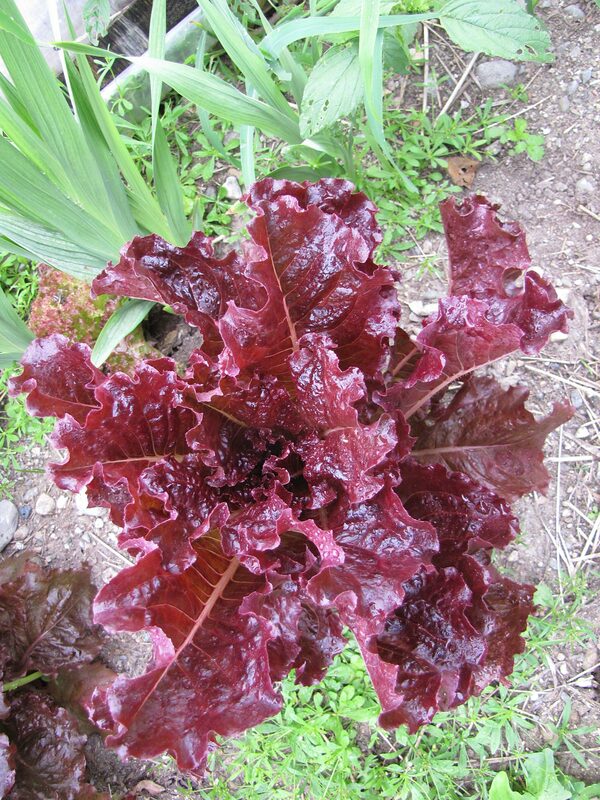 The Dark Red Lollo Rosso could be in the flower beds, it’s so pretty. Thank you so much. I love looking at pictures of the garden produce, especially in the winter. Glad to hear that everything is going so well! Happy to have found your blog. I subscribed to BWH for years and you were my favorite writer. My family lives on 30 acres in SO just south of Superior so we have the same weather. Wish I had your energy!!! I have a garden seat that is very helpful as I can neither squat or kneel. I got mine at Ollie’s for about $14.00 and it’s well worth it. If I could slim down so I didn’t squash my belly while using it it would work even better. I’ve got a plastic seat that fits onto a 6 gallon plastic bucket so I can pick beans okay but it doesn’t work in the blueberries; too tippy. How does Alisha stay tick free? She uses essential oils and dresses in dark clothes. So far she’s only had one tick, a little wood tick that was barely hooked on. We have finally had some summer weather with most of the last week highs in the upper 70’s and low 80’s here in the copper basin Alaska. Our provider beans are in a hoop house and we should get our first picking tomorrow. We have been eating zuchini for a week. 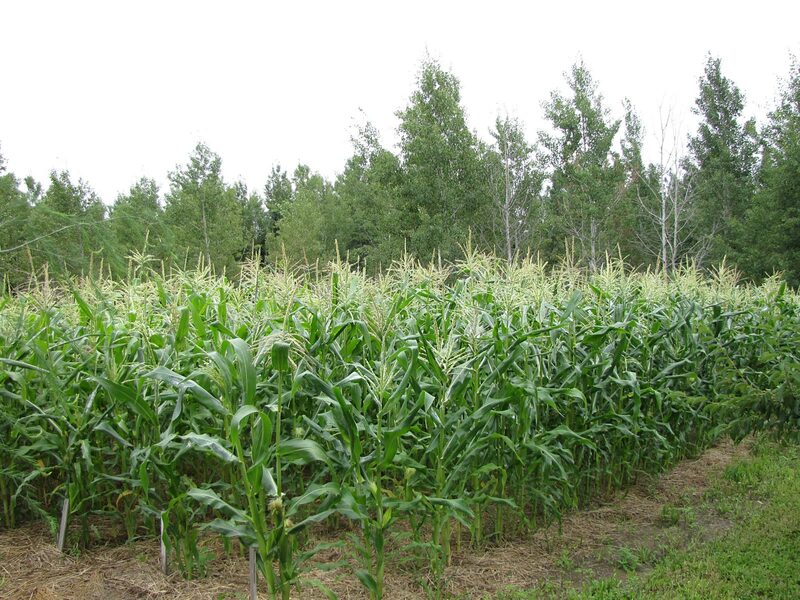 I envy you the corn. We have two short rows in the hoop house which haven’t tasseled out yet. Tomatoes looking good in the green house and setting tomatoes. Yea Summer! But it’s going by so fast!!! I’ll be praying for you to recover your energy. Just pace yourself so you don’t get overwhelmed. It’ll get done, one step at a time. We planted some Who’s Been Kissed too this year so we’ll see how it does for us. I’m jealous; our Bill Beans are still green but they’re huge! We’re still waiting for our first BLT!!! Now I’m drooling. Awesome pictures of your produce. So in addition to writing books, canning and gardening you are also a talented photographer.